Buried treasure in California exists throughout the State. There are ghost towns that hold treasure. Outlaw caches, and lost, gold and silver mines dot the State. Treasures buried by family members are also hidden here. However, to find them, you need more information. The brief stories I have posted below on various treasures need to be researched thoroughly. The more information you have regarding a treasure, the better your chances of locating one. Every professional treasure hunter understands the important of having a lot of information about the treasure they are searching for. Most often, the difficulty in locating a lost treasure is in the research. Once you have the information you need, then it becomes easier to head into the direction of the treasure, instead of running off in every direction without a clue as to where to begin. Research leads you on a path. And at the end of that path, if you did your research correctly, may be that pot of gold. 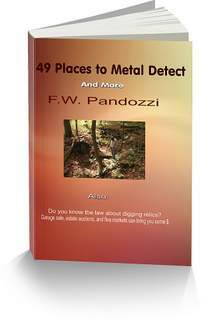 If you do not already own one, a metal detector is a good tool to use. But don’t buy an expensive model. If you spend between $350-$450 for a new detector you will have all of the features you need. Read the owners manual, and practice digging every signal until you become efficient in using it. 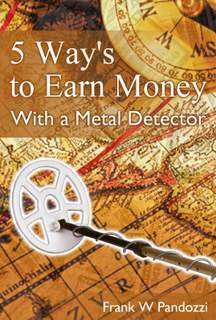 Are you interested in purchasing a metal detector or accessories? If you plan on heading into rough terrain be sure to be prepared by carrying survival gear and a topographic map. Have fun in your search for buried treasure in California. Mountaineer Roadhouse - this was a hideout for outlaws during the 1800’s. And, because it was a well used hiding place, there have been stories that several buried treasures are hidden here. The area is located on the Folsom Road, approximately three miles from Auburn, and approximately 35 miles northeast of Sacramento. The Ruins of the Mission San Pedro - San Pablo de Bicuner - are located between the All-American Canal and Laguna Dam, on the California side of the Colorado River. In 1871, before an impending Indian attack, the priests hid a large amount of treasure somewhere inside the Mission. Everyone was killed, and the Mission was destroyed. Is the treasure still there? It very well could be. The Butterfield State Route - may hold a strongbox containing $60,000 in gold. Supposedly, outlaws buried this cache somewhere on, or near the road, between the ruins of an old stagecoach station, at Carrizo, and the restored station at Vallecitos. Borrego Valley - could have a buried treasure of a large amount of gold nuggets. A wagon train carrying the gold was attacked by Indians. Apparently, the gold was hid in the lower portion of Borrego Valley, approximately five miles northeast of Carrizozo. The Oak Grove Treasure - in 1853, outlaws robbed a Wells Fargo wagon carrying $30,000 in gold. As the story goes, the bandits buried the treasure in an oak grove approximately 3 miles east of the old Rincon Stage Station, and southeast of the East Fort and San Gabriel Rivers. The Willow Creek Post Office Robbery - In 1928, this post office was robbed of $28,000 in gold coins. The robbers buried the gold coins in New River Canyon, at the mouth of New River, near Eureka. Myrtletowne has a supposed buried treasure of approximately $125,000. 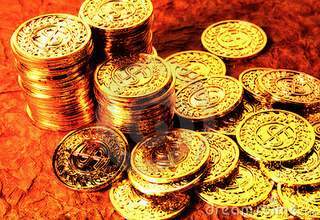 In the late 1800's a stagecoach loaded with gold bullion was robbed. The outlaws apparently buried the bullion in the town's vicinity. If you are searching for buried treasure in California and going on to private property be sure to ask for permission. If you are venturing on to State or Federal lands you should know the laws of that State. You should know what the Antiquities Act is. Have you searched for buried treasure in California ghost towns? Ghost towns exist in the east also.